Let's kick off this week's first of many posts on blogging by addressing one of the most primary concerns when it comes to starting your own blog - "What the hell do I even blog about?" A lot of people feel that they're like a can of coke that has been shaken vigorously, waiting to explode in the face of anyone who dares to open it. We all have little things to share with anyone who'd be polite enough to care about our thoughts and opinions. But since it's just a wee bit weird to walk over to random strangers on the street (or even to your loved ones) with all of this energy to start blabbing about the various thoughts that keep you up at night, most of us resort to other virtual means of sharing. The internet is a very weird place where you can find all kinds of weird people just like yourself to start a happy little online family. There are A LOT of ways to bring your unique voice into this world and blogging happens to be just one of the more old-fashioned ways to do it. So before you read the rest of this post, you need to try and think about whether or not blogging is what is best suited for you to bring your content into this world. What exactly are you planning to share? Is it something that people will benefit from mostly by watching and learning (for example cooking, painting, make-up tutorials) or is it something that has to be heard (song covers, original compositions, dialogue, comedy skits) or is it something that people could potentially see and share on their Facebook walls (comic strips, memes). When I decided to write a blog, it was because I was certain that the type of content I was going to be sharing (short stories, humorous exaggerated daily accounts of my life) was something that could only be read to be enjoyed. When I started the podcast, I knew that for the genre we selected, the topics could be driven home more thoroughly in the form of a conversation between two people discussing the same. That it would have more success as a podcast or a YouTube channel than a regular blog about social issues because people these days hardly ever have the time or the patience to read about those topics. So before you decide to start your blog, put some thought into whether or not a blog is the right way for you to share your content. If you've still stuck around to read the rest of this very long post, I'm guessing that you're sure you're into writing and feel that writing is the best way for you to share your content. It's very normal even after narrowing down the medium to which you intend to share your content, to still be confused about what to share. Like I said, you could end up feeling like a can of coke that has been given a generous shake. When you have a lot to say about a lot of things, it becomes a little difficult to bring about a structure to your thoughts and online presence. Which is why a lot of people freak out at the idea of figuring out what they want to blog/share about. I did too. So while it's important to not worry too much about what you're going to blog about, it's also key to remember that structure is very important. You need to put in a little bit of effort to compartmentalize things in a way that doesn't make you look too confused. Nothing confuses your audience more than your own personal confusion. But I will get back to structure after 6 paragraphs. Oh HELL YEAH, this one is loooooong. 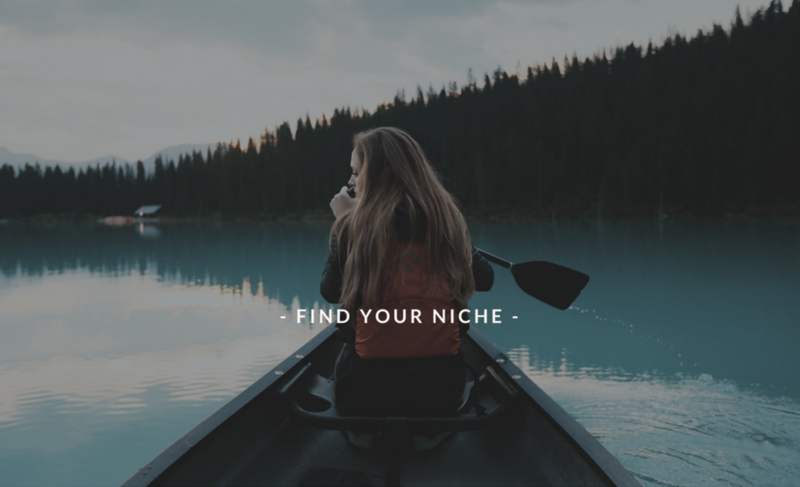 In the meantime, let me share my first piece of advice about finding your niche - before going public with your content, try to privately practice writing a post EVERY SINGLE DAY for at least a few weeks, if not a few months. I actually did this (and that too, for 3 whole months!) and THANK GOD for that! Here's why. When I started my blog privately, I thought that I was going to write short stories and stick to just that. After a week of writing and completing my very first collection of stories, an idea popped up in my brain to write a helpful essay based on my story in an attempt to provide support for the people who might relate to the story. So I spent some time doing my research and reading up other formal papers to formulate exactly what I wanted to share in this essay. Once I was done with it, I realised that I truly enjoyed writing the parts of the essay that came spontaneously based on my own personal experiences. Over time, I began to notice how the bits and pieces that I wrote spontaneously were more personal in nature, hence funnier to my audience which at the time comprised only of a very bored husband, a favourite cousin, a set of overenthusiastic parents and three best friends who always cheered me on. I realised that they appreciated those posts more than my usual stories and even thought I was funny. Now, even if I hadn't been told that I'd made someone laugh by inserting the line "Someday, I might just get off my Unicorn-That-Farts-Rainbows and slap some sense into him" at the end of a post on dishwashers, I would have sooner or later made the switch to sharing more posts on failing at baking and almost freezing to death in the shower simply because I truly enjoyed writing those posts. I would have realised (albeit with time) that my true happiness lies in sharing my authentic self with an audience that seems to be appreciating it. Even without an audience, it would make total sense to me to blog about what makes me more comfortable and happy on a daily basis - inserting a witty line or two in the process of telling my very own story. I practised every single day for three months (yes, even on the weekends) and built up a good repository of posts before I started a Facebook page to let the people in my circles know what I was up to. Giving myself that time to figure out what I was actually going to be doing with my blog was the best thing I did for myself as it gave me the space to grow without the pressure of having a dozen eyes on my work, watching my every move. Side note: I just realised that I'd been asking a budding blogger that I adore to start a Facebook page and let people know what to expect from her in order to feel compelled and motivated to keep writing. But I just remembered that I myself hadn't done it for about three months, and not going public immediately after starting my blog actually helped me in many ways. So you hang in there, Clare! You'll know when you're ready to share your precious work with strangers. But coming back to the point, although I gave myself time to practise, I still published each of those short stories. The only difference was that I managed to start off with the knowledge that the primary purpose of my blog is to put a smile on the faces of the people reading (and writing) it. Also, speaking of motivation to keep producing content, from my personal experience, I have found that this motivation and drive came naturally to me once I'd established the exact parameters of my blog. Once I figured out what came naturally to me, it became a piece of cake. I mostly never struggled with the need or the compulsion to rack my brain for inspiration. One more thing about being motivated and always finding a topic to write about is establishing a genre which isn't too small to dwell in. For example, if you feel that you want to start a blog mainly about interior design but you also end up discovering a very tiny subset under the umbrella of interior design like "Fall Styling" or "Christmas Tree Styling" and decide that you want to concentrate only on that, you might feel a bit restricted to produce a steady flow of content only a few times a year. If that's what you're going for in the first place, then by all means do it. But if you want to be able to produce content every week, then you might want to have a broad enough topic that let's you write about it all year long and gives you enough of a window to keep finding areas to blog about. My story that I shared above is not at all unique to me. I have read about many other bloggers who started off at one point only to realise what they really wanted to do, with time. For example, you could start a lifestyle blog because you feel you're passionate about a bunch of things that come under the wide umbrella of "lifestyle". You could write about cooking, DIY, fashion, home décor, gardening, cleaning and organising on your blog. But then, you may start noticing that most of your content seems to be leaning more towards say, interior design as opposed to the other topics that you thought you would blog about. Once this realisation hits, you can easily opt to dedicate your blog mainly to interior design and blog about your other less compelling passions on the side. Arriving at this realisation is important because then, it becomes easy for you to brand your blog in a way that is optimal for the topic you mostly deal with. Allow me to explain. Branding - I chose to name my blog after my very first home with The Husband because it was authentic to what I had come to realise my blog was going to be about. It was going to tell our story in my voice, and our little home with all its imperfections seemed like the perfect place to house all of my musings. But had I jumped the gun and named it while I was still under the impression that the blog was going to be full of short stories, I would have ended up with a problem. Because "Story Land" or "Short Story World" or "Bedtime Stories" would have been disastrous names for a blog about a young immature couple trying to live together and figure out the whole process of feeding themselves, paying bills and general adulting. Especially "Bedtime Stories". Oh God, that would have been SO WRONG! Keep your kids away from this blog, all ye sane people! That said, you might wonder why my domain name doesn't have the name of my blog in it. This is because even before I thought about blogging, I used to tell The Husband that one day when I have my own website, it would be called ankitanarayan.com or it will have something to do with my name. Later, The Husband purchased the domain "ankita.ink" as a surprise birthday present for me because a) it had my name in it and b) "ink" for my love for writing. Moreover, if anyone were to organically search my name in order to find me online or on social media, ankita.ink would most definitely pop up in their search. It was a very personal choice and I wouldn't change this domain for the life of me. I feel that 22 Nelson Street lives very happily in the warm and cozy blanket of ankita.ink but I wouldn't advise you to do exactly what I did. It just makes sense to me but you should know that generally, people name their domains after their blogs. I hope that so far, everything I shared made sense. First, practise blogging for a while just to get your thoughts and style out there in order to figure out for yourself what you truly enjoy doing. Then, brand your blog or website adequately with a name that you feel depicts your values and personality. Going back to structure as I promised 6 paragraphs ago, now that you know what your blog will be primarily concerned with and what it will be called, you should dedicate some time to organise all of your content under proper tags and headings. Compartmentalise them in such a way that even if you do break from your pattern and blog about something different once in a blue moon, your audience will know where the post is coming from and where it's filed. This is so that those among your audience who enjoy these particular kinds of posts can go back to the tag and read all the posts filed under it. Structure is key and it's something you need to establish from day 1. Once again to recap: practise, find what makes blogging a happy experience for you, name your blog based on your findings, organise your content with tags. Then, my dear, get down to the business of discovering your own voice. Here's the thing. You write because you love reading. I can't imagine a single reason why a person who detests reading would ever sit down at a desk to voluntarily type out even 200 words of content. I believe that if you want to write, then you must be spending time reading in one way or the other, be it other blogs or good old fashioned books. But the problem with us who read is that we can easily get enamoured by another writer's style and voice and even unconsciously try to emulate them because we very badly want to be them. If not them, we at least want to produce the kind of content that they do. Hell, I've read Big Magic five times now and I noticed around the fifth time that I was beginning to sound like a juvenile version of Elizabeth Gilbert on my blog. When I went back and re-read my Harry Potter recently, a little bit of Rowling seemed to have crept in because I got more than a few personal messages from readers telling me that I was their own little version of JK Rowling. And all those messages came around the same time so I can guess what happened there. By the way, I hope to dear God that my imaginary best friends Gilbert and Rowling don't take offence at what I just said, considering how this amateur couldn't possibly even hold a candle to them. Yet. But my point is, we humans copy. Consciously or unconsciously, we do it and we do it from the time we're born. We do it in writing the way we do it when we see someone's Instagram post and hashtags with their fancy schmancy food styling or clothes. We do it unintentionally, we do it meaning no harm, and we do it in the hopes of escaping notice. But eventually, we end up doing harm - to ourselves. So if you're still emulating someone you look up to, someone who's style you admire, remember that you're not doing yourself any favours in the process. You're only stunting your own growth and exposing a fraud to your audience. This may sound harsh but I have to say it. Your readers will know if you're not being authentic. And I'm sure you can understand this because as I said, you write because you read and if you read, you understand how a reader thinks. So THINK like your readers. No matter how hip or cool or funny or "deep" that the other person you admire might be on their blog or book, trying to be exactly like them is not going to make you happy. When you're not producing content which is true to yourself, when you're not writing about the things you truly enjoy, when you're using someone else's journey as a template for your own, everything goes wrong. You don't feel as happy doing what you do, you feel suffocated under the pressure to keep trying, and finally when you don't achieve the same things that they did in the mental timeline you set for yourself based on the life of your idol, you get way more disappointed than you would have, had you been on your own from the beginning. So try to put in the conscious effort to be real, to be you on your own blog. Once you find your voice, your area of interest, the perfect name for your blog, and even organise all of your content systematically, the next step is patience. Because no matter what you're blogging about, trust me when I say that you have an audience out there. You might think that yours is going to be the very first blog on the internet about the types of party hats but a simple search on google will tell you how wrong you are in your assumption. In this age of the internet, your niche is not going to be limited to a group of 100 or 1000 people. The number could be as big as a few millions. And allowing yourself that space to grow is what I will be discussing with you on Thursday. I hope that everything I shared today was useful to you. If there's anything else specifically that I may have left out, please feel free to leave a comment below so that I can get back to you. And now that you (hopefully) know how to figure out what to blog about, it's time to teach you how to set up that little blog of yours. Tomorrow, you will be welcomed to 22 Nelson Street with The Husband's weird sense of humour on his post about setting up a blog. Until then, happy blogging! I hope you start your little private practise blog today. Like, right now. Why are you still here? Go open that can of coke, kid!